Quick and easy meals are the way forward. Who wants to spend hours in front of a stove when it is one million (and no, I won’t stop exaggerating!) degrees outside? I’d much rather throw dinner together in a few minutes and actually be able to enjoy these summer evenings – even if they are ridiculously hot. These 30-Minute Pork Fajitas tick all the boxes. They’re fast, require few ingredients and taste great! What more could you want for a weeknight meal? I know I’ve moaned previously about the serious lack of Mexican ingredients here, taking into consideration that I live on a Spanish island, but I discovered something fantastic last week. Whilst wandering around the food aisles, I spotted an international section, with treats categorized into different countries. Okay, some were a bit out – since when were fig bars from Germany and how long has Latin America specialised in coconut milk? – but the Mexican section was spot on. In addition to the common salsas and guacamoles, I found tomato tortillas and corn tortillas – which I’ve been wanting to try forever. So now I’ve got cupboards packed with tortillas, get ready for a blast of Mexican-inspired dishes! 1. 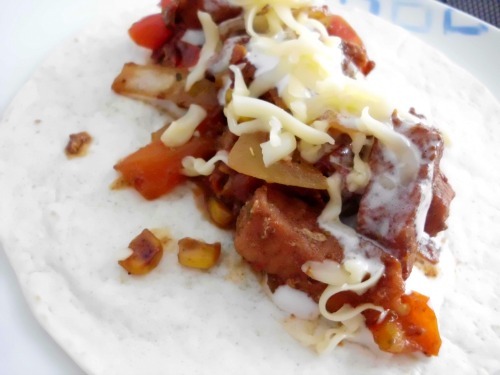 Mix the diced pork with the taco seasoning and leave to marinate for a few minutes. 2. Meanwhile heat a small amount of oil in a frying pan and fry the onion and red pepper together for about 10 minutes over a medium heat. Add the sweet corn and tomato and cook for another 5 minutes. 3. Add the pork and cook for a further 15 minutes – stirring regularly – or until the pork is cooked through. 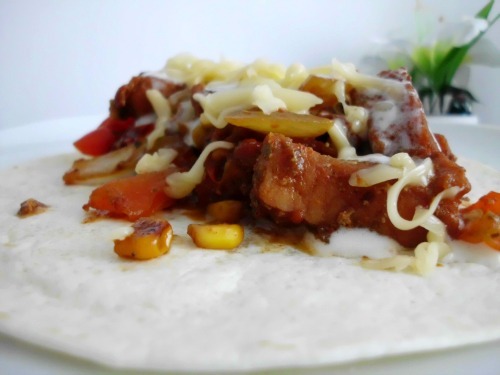 Whilst the pork is cooking, warm up the tortillas in the microwave or oven. 4. 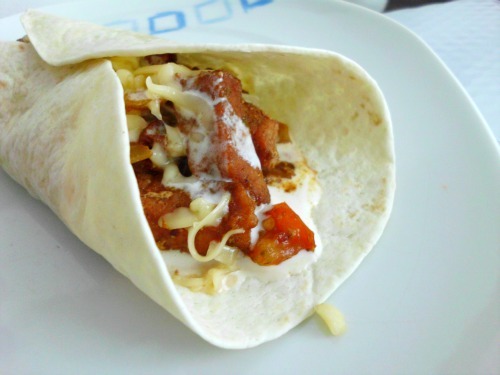 To assemble, spoon some of the pork mix into the centre of the tortilla and top with sour cream and cheese. Here are the link parties I take part in. 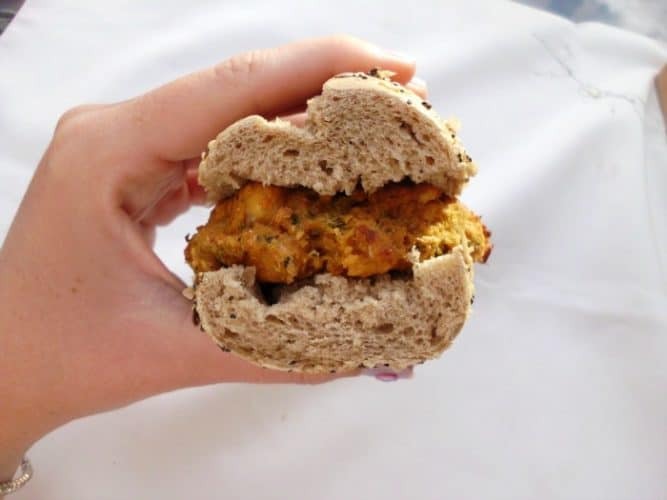 These BBQ Cheddar Chickpea Burgers are the first veggie burgers I’ve ever eaten and I can’t believe they’ve been missing from my life for so long. They are so good that even my chickpea-despising and veggie-hating Official Treat Taster went for a second bite. Okay, so the burger was covered in so much sauce and cheese that he probably couldn’t taste the veggies or chickpeas, but that is beyond the point. The point is: these burgers are fantastic and you need to make them for lunch right now. 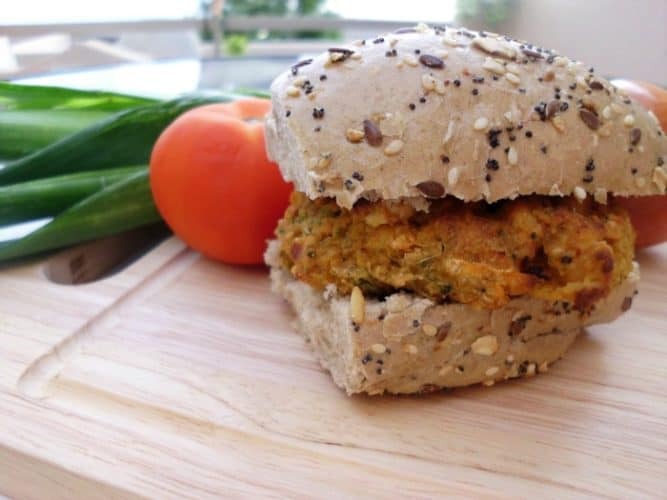 The original recipe calls for a food processor, but if you don’t have one (like me) don’t worry – you can still make these burgers. Instead of putting all the ingredients into a food processor, place them all into a large bowl and use a hand-held processor to mix everything together. This is what I did and it worked brilliantly. If you don’t have a hand-held processor, you could always try mashing the chickpeas with a potato masher and mix everything together with a spoon. These burgers freeze really well. In fact, I have several mini-burgers wrapped in plastic and stored in my freezer for when I’m in desperate need of a snack, but want something healthier than whatever dessert I have in my fridge. 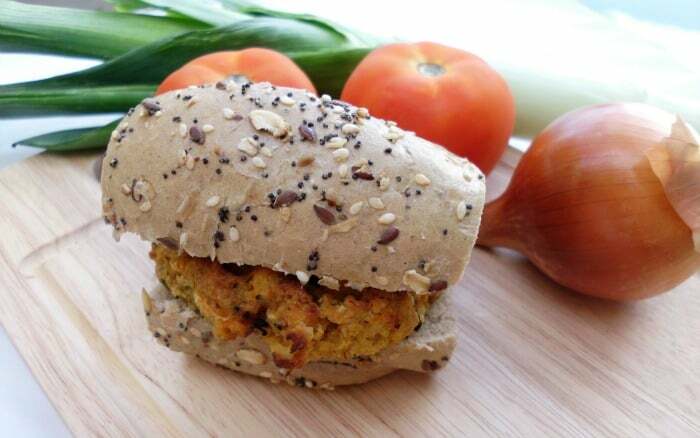 I just grab a burger, blast it in the microwave for 4 minutes and devour my almost-instant, nutritious and tasty snack. Preheat the oven to 390F. Heat a small frying pan over a medium heat and fry the onions until softened. Combine all the ingredients into the bowl of your food processor and mix until completely combined. Be careful not to over-mix - you don't want gloopy burgers, you want thick, chunky burgers packed with texture. Form the mixture into 6 burgers. Lay the burgers on a baking tray and bake for around 30 minutes, or until crispy and golden on the outside. Chilli is a great dish to enjoy on cold winter evenings. 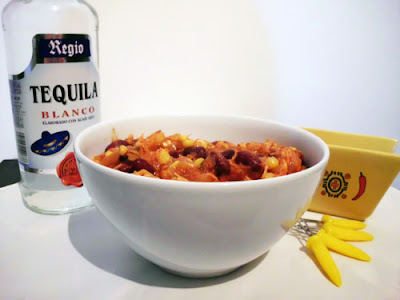 I came up with this recipe in an attempt to find a type of chilli that I enjoy. I love the idea of succulent beef chunks in a rich, spicy tomato sauce, but when it arrives on the table, I’m always disappointed. I’m not sure if that says more about my fussiness or my cooking! 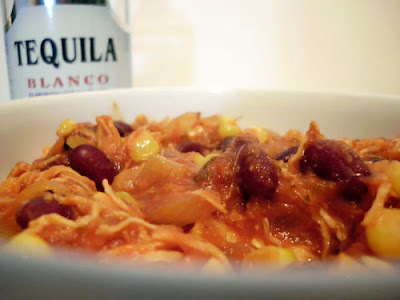 This chicken taco chilli recipe is a great Mexican take on a traditional classic. The additional ingredients really take this dish to a whole other level that I feel regular chilli recipes really lack. I can’t wait until the clocks go forward! These pictures were taken using the mother-in-law’s daylight lamp and just seem to give the photos a hint of blue. Bring on summer! 1. Place the chicken in a saucepan and add enough water to just cover the chicken. Bring to a simmer and cook for between 20-30 minutes. When fully cooked, drain the water and shred the chicken with two forks. 2. Chop the onion, garlic and red pepper and fry over a medium heat for 10 minutes. Add the kidney beans, sweetcorn, chopped tomatoes, tomato paste and taco seasoning. Let simmer for another 10 minutes. 3. Add the shredded chicken and cook for a final 10 minutes, stirring regularly. Papas arrugadas is a hugely popular dish in the Canaries served with the mouthwateringly-good red and green mojo sauces. And a small pot of creamy aioli, if you’re lucky. Whether you eat them on their own with the previously mentioned sauces or use them as a crowd-pleasing side dish to go with something awesome like Adeje chicken, everyone loves Canarian potatoes. And when you find our just how quick, easy and cheap they are to make at home – you’ll be eating them at every meal! I came up with this recipe shortly after Christmas as a creative way to use up the left-over turkey. 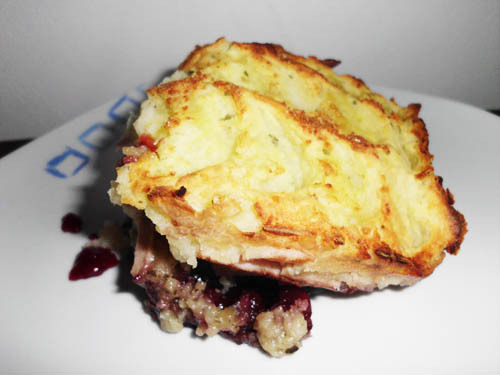 The cranberry sauce really makes this dish something special. It’s never going to win any beauty contests, but it tastes to fantastic that I don’t care! A layer of chopped vegetables – such as parsnips, Brussels sprouts or carrots – would work really well in this recipe, but Boyfriend wouldn’t let vegetables near the casserole. This recipe serves two, but can easily be changed to serve more or less people. 1. 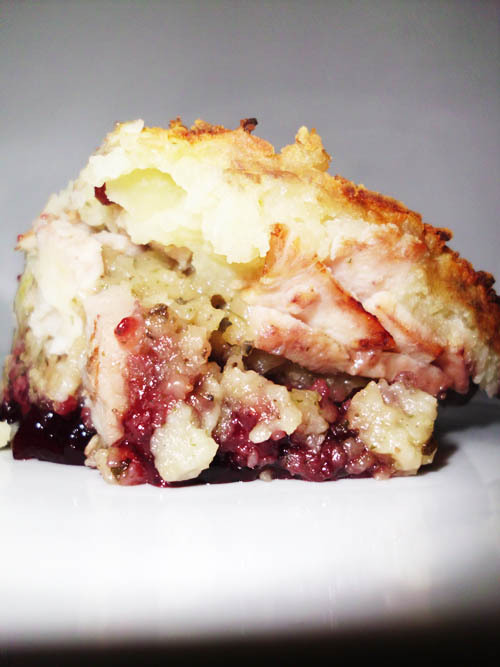 First, make the cranberry sauce layer. Place the frozen cranberries, in a saucepan with the sugar and red wine over a medium heat. Leave to simmer for 15 minutes before pouring into a baking dish. 2. Layer half of the turkey slices on top of the cranberry sauce. Spread the stuffing on the turkey and top with the rest of the turkey slices. 3. Preheat the oven to 180C and peel and chop the potatoes. Place in boiling water for around 20 minutes until they are soft. 4. Thoroughly mash the potatoes then add the soft cheese and continue to mash until well blended. Finely chop the chives and add into the mashed potato. Mix well before spooning on top of the turkey slices. 5. Place in the oven for around 20-30 minutes.